You should not just plant a tree, walk away and hope... you need to mind your “P”s ! What's your planting scheme? What are the objectives of the planting? Are you eventually going to produce quality timber? What species (Provenance) ? What spacing ? What management regime ? Succession planning – will there be continuity of management over two or three generations ? Does the soil need amelioration or improvement? Spray off grass/existing ground cover to avoid smothering the young trees and competition for nutrients and light. How are you going to protect the young trees from pests and avoid damage from grey squirrels, deer, rabbits, voles and ongoing competition from weeds. Are you going to carry out “Formative Pruning” and how often? When are you going to pick your final crop trees ? You need to thin out the weaker trees of poor form and give your winners the best environment to realise full Potential. Are you going to “High Prune” your final crop trees and if so when and how frequently? You are growing the trees for the generations that will follow you. Recognise that it is a long term Pursuit. Harvest the selected trees, Process, Plank in a sawmill, dry and then resaw and Plane ... enjoy the most beautiful, natural and renewable raw material available to mankind. Plough back some of the Profits into re-planting for future generations. Try to ensure that what you do is sustainable over the long term. This guide is intended for anyone establishing trees in a woodland setting. The recommendations here are aimed particularly at broadleaves established in the lowlands on mineral soils. If planting in upland areas or in heavy or peaty soils, seek additional advice. 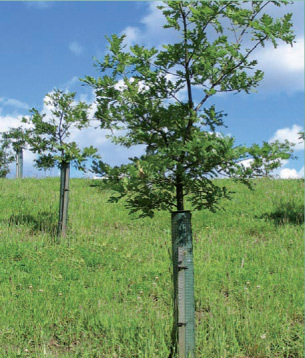 Successful tree establishment relies on three key stages: planning, planting and aftercare. Each of these must be carefully coordinated to minimise risks of failure. It is usually most efficient to plant trees in rows at a uniform spacing to simplify aftercare and maintenance, especially if a mower is to be used to control vegetation. Curved rows may be visually more pleasing, especially when the plantation is young. Spacing trees at 2 x 2 m or closer is desirable to encourage them to grow tall, straight and to promote self-pruning. The closer the spacing, the better the eventual quality of the trees will be. Don’t aim to plant the whole area – remember to leave some open space for wildlife habitats, amenity and access. Good quality planting stock (Figure 1) is essential and seedlings should be sourced from a reputable forest tree nursery. Young trees are supplied either barerooted or container-grown. With broadleaved species, sturdy bare-rooted seedlings (‘transplants’) 40-60 cm tall are most commonly used. 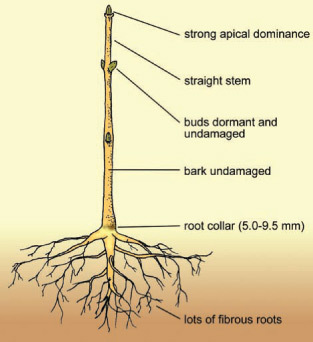 A key feature of all stock is the root collar diameter, as there is a strong link between this and survival after planting. For bare-rooted stock this should be 5 to 9.5 mm; the minimum for container stock can be a little smaller. Care in handling planting stock is vital. Drying of exposed roots caused by exposure to wind or sun is a major danger. In the field, keep bare-rooted plants in bags and in a shady place if not to be planted within 24 hours. Never mishandle bags containing trees. Planting should simulate seedling development in nature to ensure later stability and good growth. Roots should spread radially and not be squashed into planting holes that are too small. The roots of container-grown stock sometimes grow around the container walls in a spiral fashion, giving rise to deformity and later to instability. Gently loosen any root-bound material before planting. Slit planting is fast, effective, and favoured in commercial operations when there are many hundreds, or thousands of trees to plant. Usually a ‘T’ notch is cut in the soil, and the tree pushed in behind the spade. The plants must be upright. Pit planting is much slower but it is easier to achieve better results by ensuring a good spread of the roots. It is recommended for school, community and small-scale tree planting schemes. Pit dimensions should be at least 15 to 20 cm more than the root ball of the plant. When refilling the pit, the tree should be gently shaken up and down to ensure good contact between the roots and soil. Trees should be planted so that the soil level is at, or possibly very slightly above the nursery soil mark on the stem. The soil should then be gently trodden with the toe of the foot, so that the roots are well firmed (but not compacted) into the surrounding soil. A gentle check (tug) to ensure that the seedling is firmly planted completes the job. Bare-rooted stock should be planted when dormant (late autumn or spring) and during mild weather. For broadleaves in the lowlands, autumn planting is generally preferred. Container plants can be planted throughout the growing season, but best results are still obtained in the autumn or spring when there is no active shoot or root growth. There is much variation in size and design of shelters (Figure 2), and choice is dictated by the budget and the type of protection needed. 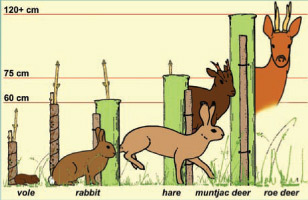 For large planting schemes, fences are usually more economical but design and cost will vary if protecting against rabbits/hares and/or deer. Watering is beneficial, especially during dry periods in the first growing season, but is usually only practicable in small planting schemes. During the early stages of tree establishment on open ground, the high availability of light, water, and nutrients leads to explosive development of competing herbaceous or woody vegetation. Competition for water in mid-summer is usually the most important factor in lowland Britain. Weed control may be critical for survival and it can result in dramatic improvements to growth. A realistic aim is to maintain a weed-free zone of 1 m diameter around each tree or a 1 m wide strip along each planted line. A lot of effort is often wasted on cutting grass round young trees. Unless the grass physically smothers them, cutting is generally not advisable. This is because cut grass has a greater demand for water than uncut grass, thereby increasing competition with newly planted trees for this vital resource. Mulching with proprietary mulching mats, pulverised forest bark, wood chips or heavy duty polythene sheeting. Propyzamide (Pronamide), often sold as “Kerb”, is sprayed or sprinkled as granules around the base of seedlings in winter to prevent germination of grasses. Glyphosate (e.g. “Roundup”) is a contact herbicide that is applied during the growing season and is effective on a wide range of plants. Often both chemicals are used in the early stages of woodland establishment to give seedlings the best start. Some weed control might be needed for up to 5 years. It is important to observe the proper environmental and safety precautions when using chemicals. In summary, the successful establishment of broadleaved trees depends upon good planning, careful planting and diligent aftercare. If you achieve all three, you can anticipate a successfully established woodland within five years, of the type shown on the front cover. Other educational leaflets are available on request covering Formative and High Pruning techniques, please email enquiries@woodlandheritage.org.uk for more information. A PDF of this leaflet can be downloaded here.